Use your senses and pay attention to what’s around you. You never know where inspiration might strike! 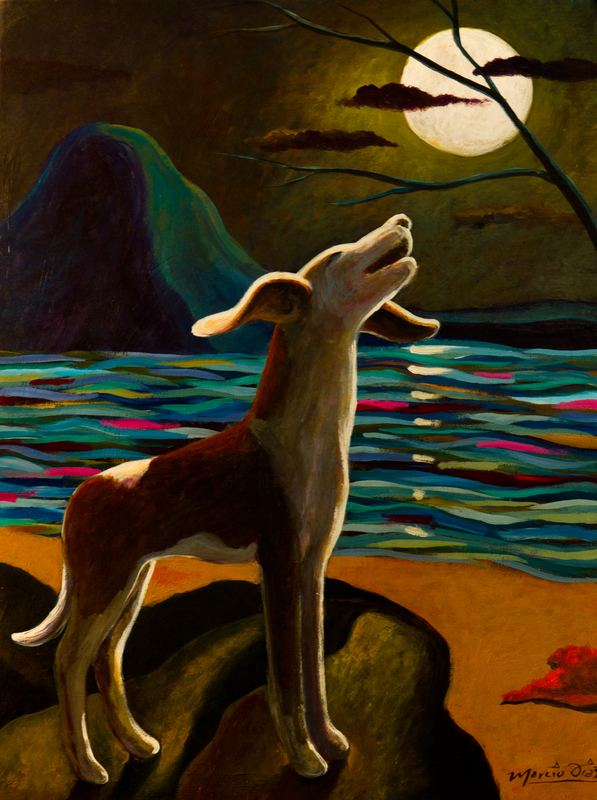 These are two of the lessons that I focus on when presenting my bilingual children’s book, Doley the Guatemalan Street Dog: The Sounds of San Marcos, to students. 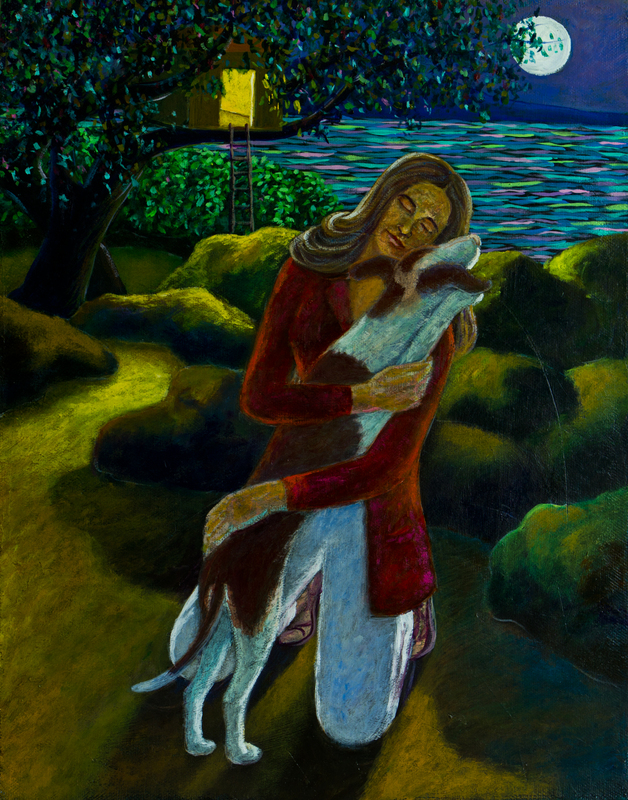 I never would have imagined that my time living in a treehouse above Lake Atitlan in Guatemala, and my special friendship with a starving little street dog, would direct the course of my life for years to come. At 20 years old, I traveled by land from Seattle to Guatemala. The trip took over a year, with stops along the way to find work when the money ran out. Guatemala was never on my list, but I loved my time in Mexico and wanted to continue south. I joined up with a traveling companion for a long, bumpy, chicken-bus ride from Chiapas, Mexico, to Panajachel, Guatemala. An immediate and special feeling for this country struck me. I was determined to find a way to stay in this beautiful land. I found a work/trade in a meditation center in the little village of San Marcos La Laguna, one of twelve villages around Lake Atitlan. There was no electricity there at the time. We lit our way with candles, stars and moonlight. My home was a simple bamboo treehouse with one room, a doorway, two windows, and gauze curtains for privacy. At night, I would sit in my treehouse and listen to the many sounds of San Marcos. The breeze blew in, offering constant connection with the lush natural environment. One day, I was preparing a meal in the community kitchen when a tiny, frantic puppy ran in and looked at me with desperation. She had one bright blue eye and one brown eye. After I instinctively gave her a tiny piece of bread, this little puppy visited me daily. She had mange, a belly full of worms, layers of ticks in her ears, and malformed legs which made it difficult for her to walk. I took care of all of these problems, one by one. I wrapped half an ace bandage around each of her legs so that she could walk without her legs buckling, and fed her eggshells to strengthen her bones. Over time, she healed and followed me everywhere I went. 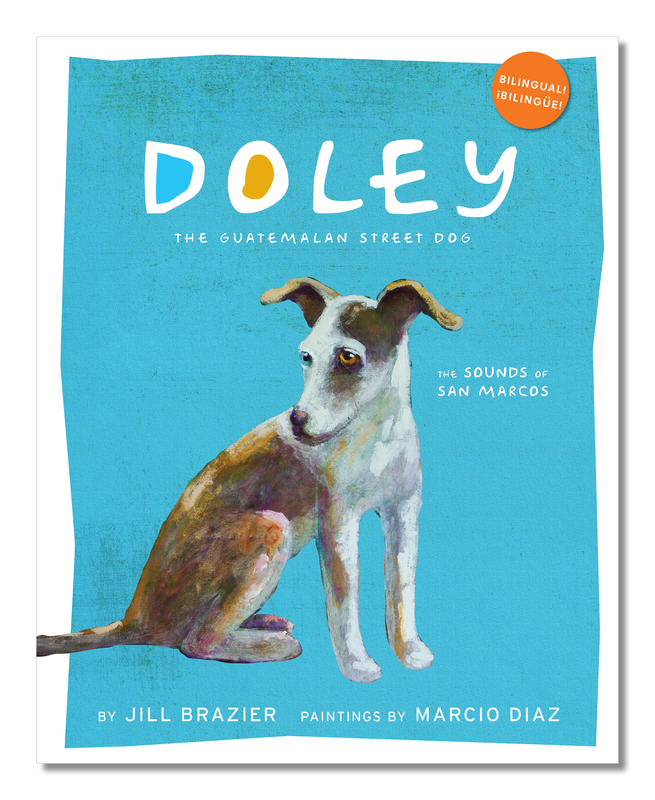 Soon, this Guatemalan street dog had a name: Doley. This was the beginning of our fourteen-year friendship as best friends and travel companions. Doley would sleep in the treehouse with me at night, cuddling right into the crook of my stomach. Often, she would wake up to the sound of other street dogs howling and barking, and insist on being taken down from the treehouse, to run and howl with the other dogs. All of these real life experiences, which Doley and I shared during our time together in Guatemala, appear in the book. The Sounds of San Marcos, was released independently in 2012. 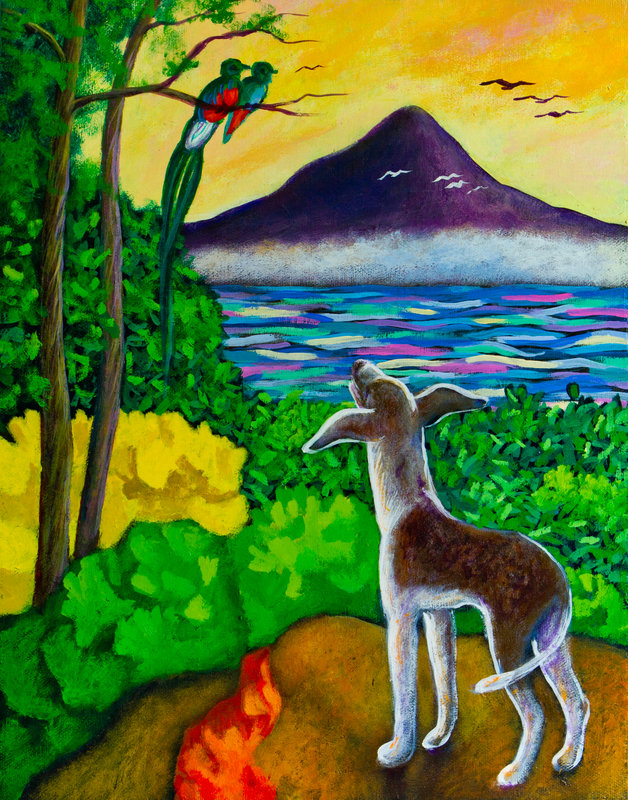 The theme of sounds emerged as I wrote the story and reflected on Doley’s acute sensory awareness of everything around her as a street dog, and our rich, sensory experience of living a treehouse in Guatemala. Readers learn the importance of listening – a vital lesson for students and young people! I further developed the idea to make Doley a series based on the five senses. It can feel like a daunting task to create something new and find a place for it in the world! There are many ways to share our stories and creative visions. For this project, I chose to publish independently in order to create the books in exactly the look and feel that I wanted. There are many ways to publish these days, and advantages and disadvantages to each. Artists and authors can choose which path to take according to the particular project, goals, intentions, budget, and timeline. Publishing independently was the right place to start for Doley, and I am thrilled with the result. Everything about it is true to my vision and meets my standards of excellence. Moving forward, I will find a strategic partner to maximize the potential of the Doley series and accompanying reading guides. The Read with Doley Reading Guide, developed according to the National Common Core Standards (K-2 Literature), consists of 134 bilingual questions and answers, designed to engage students in language learning and encourage them to think beyond the text, and is available to download for free on my website. Doley believes in education! 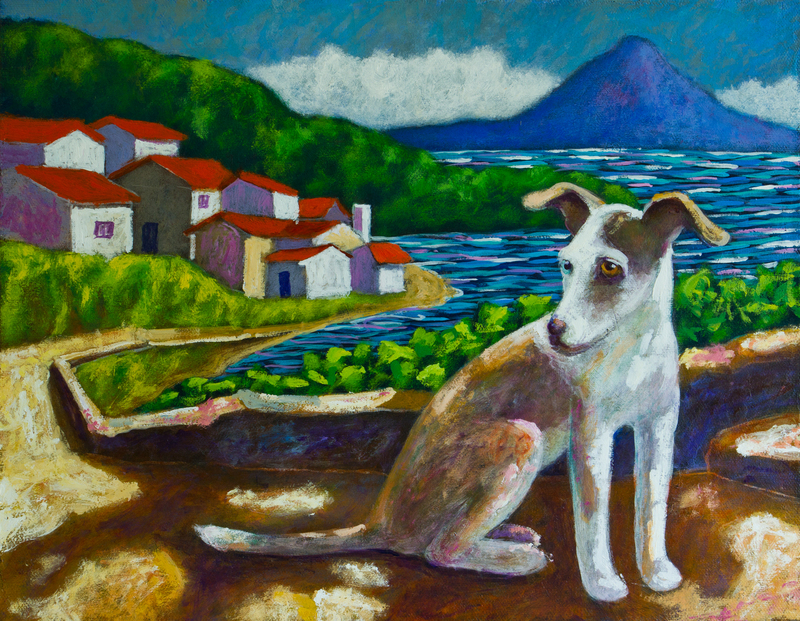 The next book in the series, Doley the Guatemalan Street Dog: The Caravan of Colors, will be released in September 2015 and also features the remarkable artwork of Marcio Diaz, along with its own reading guide. The story is inspired by some traveling performers I met in Guatemala and my own love of trapeze. The Caravan of Colors gives Doley the chance to explore the world around her through the sense of sight, and provides lessons about perseverance and friendship along the way. It is always a joy to share Doley and the inspiration for the book with students – and to remind them to listen carefully and pay attention. You never know where inspiration will strike or where it may lead you! I am so grateful for where inspiration has taken me. When Jill Brazier isn’t writing about Doley, she works at a charming Italian restaurant in Seattle. 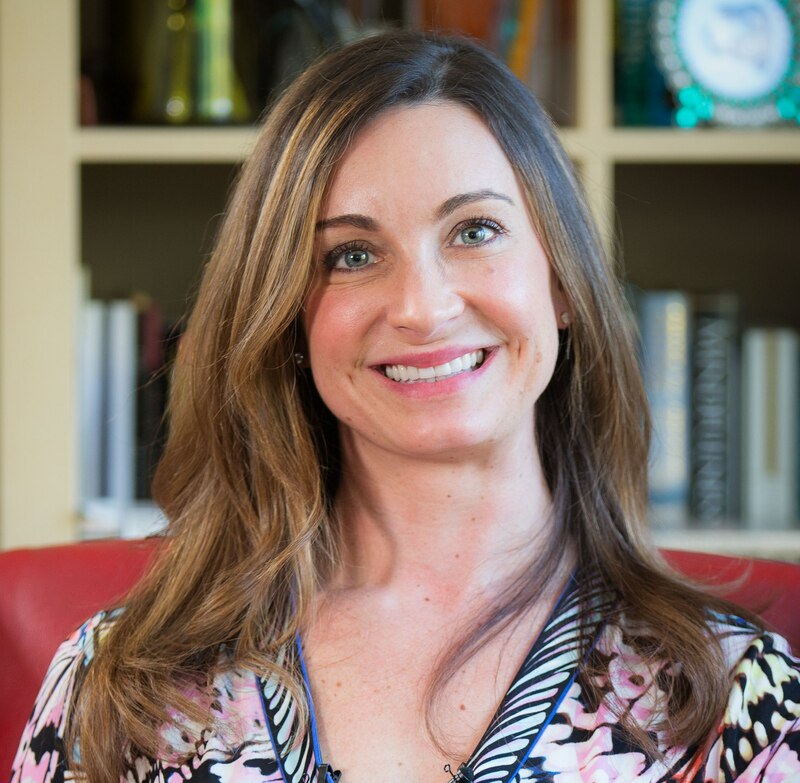 She is a traveler, fitness enthusiast, yoga practitioner, and amateur trapeze artist. After Doley, Jill’s heart belonged to a 12-year old abandoned Husky. They spent three happy years together until she passed away at the age of 15. Jill remains without a dog for now, until the next one chooses her. This book sounds absolutely wonderful — I plan to read it as soon as possible. Both the story and the artwork are heartwarming and beautiful! Thanks, Jill, for sharing your story and book with us. I feel connected to your story because Chiapas, Guatemala and the Suchiate River between them are major parts in my novel, including their Mayan culture. I’m more familiar with Guatemala City but just looked at videos about San Marcos and Lake Atitlan on YouTube. Nice. The paintings in the book are very pretty. Best wishes with this book and your next project. Thank you so much, Giora! I appreciate you taking the time to read about Doley and I. Chiapas has a special place in my heart. I loved my time there. What is the name of your book? I’d love to check it out All the best to you! Abrazos!